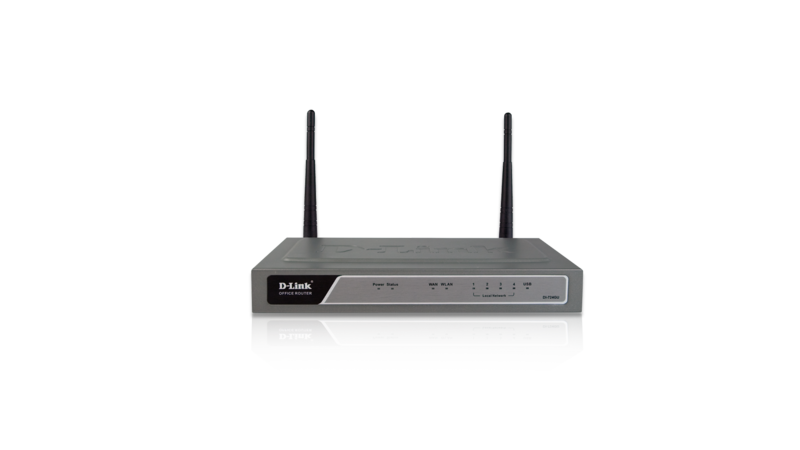 D-Link’s new DI-724GU Gigabit Office Router integrates several highly useful features to make your business more productive. The Office Router combines Internet sharing, a USB print server, a QoS engine, gigabit LAN ports, and a D-Link 108G wireless access point in a rugged new metal chassis. Centralize printing services, improve VoIP performance, and transfer files at Gigabit speeds using D-Link’s new Office Router. The Gigabit Office Router uses QoS technology to improve the quality of VoIP calls. Typical Internet applications such as e-mail and web browsing require minimal bandwidth, but other applications are real-time sensitive and require much higher bandwidth, such as Voice over IP (VoIP) and video streaming. The Gigabit Office Router uses an intelligent engine to automatically detect and prioritize bandwidth-sensitive packets so that they can be sent over the Internet as soon as the request is made. This results in faster processing of real-time based packets, less latency, and a better user experience. The Office Router’s USB 2.0 port can be used for both print server functionality as well as Windows® Connect Now. Connect a USB printer* to the Office Router and enable printer sharing amongst all network users. Using the PS Wizard, easily set up an attached printer for printing on the network. Reduce costs of purchasing additional printers or having to dedicate a PC for printing services. Windows Connect Now makes configuring the wireless settings as simple as running the Wireless Network Setup Wizard from Windows XP SP2, and transferring the wireless settings using a USB flash drive. Each component of the Gigabit Office Router was designed for maximum performance -from the rugged metal chassis to each internal component. A high-speed CPU that powers the robust routing engine provides best-of-class networking performance and has the capability to handle heavy network traffic and printer sharing while maintaining smooth Voice over IP (VoIP) calls. The integrated wireless access point uses dual 3dBi antennas for exceptional wireless signal range and delivers a maximum wireless signal rate of up to 108Mbps** when used with other D-Link 108G devices. Gigabit LAN ports enable lightning fast transfers for compatible clients within the network. The Gigabit Office Router features Stateful Packet Inspection (SPI) and Network Address Translation (NAT) double firewall functionality with Denial of Service (DoS) attack protection to safeguard your network. Security features such as these can be enabled without reducing network performance. In addition, an improved access control system blocks inappropriate content and keeps employees focused on business. Make the most out of your network with this all-in-one wireless router, print server, and VoIP enhancer. Increase the versatility and performance of your network with the diverse functionality of D-Link’s new Gigabit Office Router. ** Maximum wireless signal rate derived from IEEE Standard 802.11g specifications. Actual data throughput will vary. Network conditions and environmental factors, including volume of network traffic, building materials and construction, and network overhead, lower actual data throughput rate. Environmental factors will adversely affect wireless signal range.